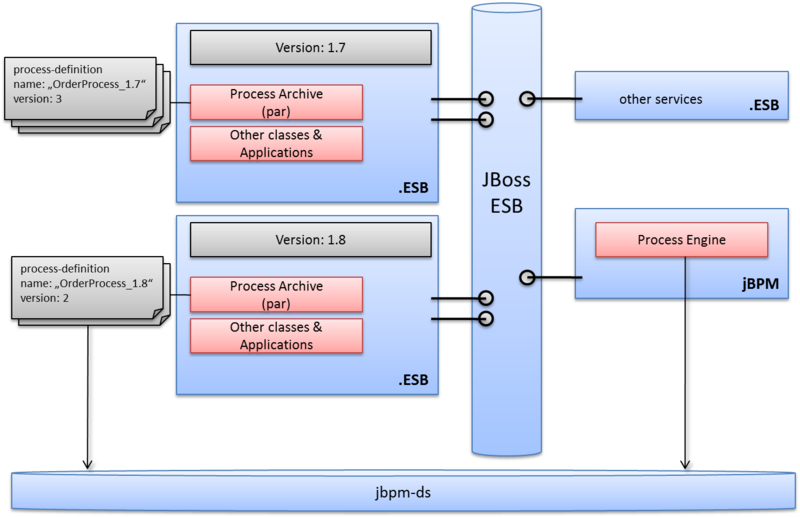 What we want to achive is a working environment based on JBoss AS, ESB and jBPM. Mixed in the soup we need to use JTA transactions and scoped Classloading because of different versions deployed in parallel. An overall requirement is being extremely scalable and robust, because the company will have a huge amount of transactions on their systems. As a side issue a concept for deploying and correct versioning of jBPM processes should be developed. Correct versioning means aligned with the application and service versioning in place. I want to present different aspects we tackled and our current solution, which I called the jbpm.deployer. New versions of an application or service are not compatible with the old one. So the old version must continue to run in parallel to the new one. Clients specify which version they use and keep using the old one until they explicitly update to the new one (cause this may involve changes, testing and so on). Patches are compatible fixes of one version. The patched code replaces the original code. The changes have to be transparent to the client. First of all the application versioning is solved by adding the version to the EAR name. By doing so, the different versions can be deployed in parallel on a JBoss application server (by switching on scoped classloading, for more information refer to the JBoss Wiki). Basically with EJBs this boils down to have different JNDI-Names for different versions of enterprise beans and a common helper class being responsible to find the right reference for you. This is basically the same for ESB deployment artefacts, but having different service names, not JNDI names. The question is how jBPM process versioning (see jbpm user docs for details) can fit into that logic? There may be in fact different approaches, what we did is to add the version number to the process definition name as well (so the process name gets for example “OrderProcess_1.0”. 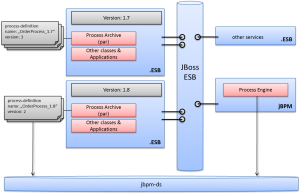 A new version (not patch) of a process becomes a completely new process definition in jBPM. The built in versioning of jBPM is used only when deploying patches. If a processdefinition.xml gets patched, a new jbpm process version is deployed to the jBPM database. Note that if you have a patch in the process definition, running process instances keep running in their versions! If you want to migrate them to the new version this can be done by writing some “migration script”, which can be implemented by a jBPM Command (see Command ApiDoc), a good starting point is the ChangeProcessInstanceVersionCommand. This can be (more or less) easily extended to maybe take Groovy scripts for process migration or anything else that make sense in your environment. Writing Java classes to the jBPM database, which is possible if you add them to your process archives (.par, see jbpm user doc for details) like described in the jbpm user doc, does not make sense in our situation, because patches normally replace the existing code base. And really new versions resist in different deployment artefacts, so you can have different versions of the same Java class. This is a good thing, since in my opinion Java code should be placed in “normal” deployment artefacts (EAR, JAR or the like) and put on the “normal” classpath as often as possible. Only in some rare cases you still want to write code to the database (and then you can still do it). But now we get to the very interesting part. Let me add one additional “background” information: jBPM should obviously run “just once” in our application server (as shown in the picture above). We do not want to package jBPM inside of every EAR or ESB archive we deploy, and basically this would also not work in every situation. And for monitoring and management we want to be able to connect to this central jBPM instance. For example the web-console shipped with jBPM could be used to look at process instances and maybe trigger one of them (trigger means sending a signal to the token in the jBPM vocabulary). Now: How can this central console load classes which resist in different EARs or ESB packages? The solution we built in order to achieve this builds upon the ProcessClassLoader used by jBPM. This classloader implements the functionality to load classes from the database for a specific process definition (in a specific version). If the classes are not found in the database, it delegates to the parent class loader. Starting from jBPM 3.3 (scheduled for November 2008) this class loader is configurable via the jbpm.cfg.xml (see Jira: JBPM-1148). One additional side note: A problem with it was, that this ProcessClassLoader was not set as ContextClassLoader when executing delegation classes (actions, decisions or the like), I fixed this as well for jBPM 3.3, see Jira: JBPM-1448). For the solution we build our own ProcessClassLoader, loading classes not only from the database but also from the right EARs. As mentioned we can configure jBPM to use it, so there is no need for any dirty hacks. But wait, how do we know which are the “right EARs” for classes? To answer this question I want to show briefly how packaging works in our environment. As you can see in the next picture, process archives (see jbpm user docs for details), containing the processdefinition.xml along with the image and maybe Java classes (but hopefully not as stated above), are put inside of an ESB or EAR archive (the described solution works for both cases even if we normally just use ESB archives). Classes required by the jbpm process have to be in the ESB package too, if they are not on the app server classpath (e.g. lib directory). Register the ClassLoader of the current deployment unit (e.g. 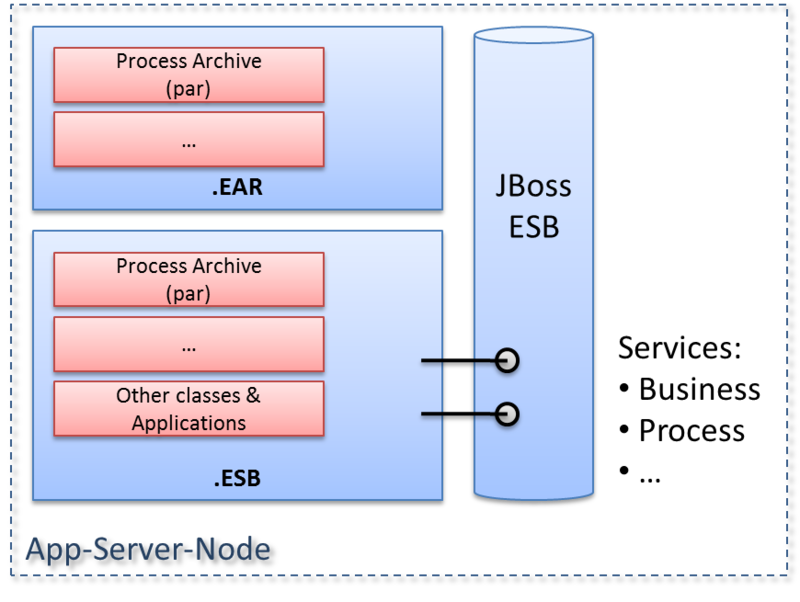 the ESB or EAR) in a central in-memory registry. The whole deployer is just a directory on your jboss application server, which contains this MBean, the jbpm libraries and the jbpm configuration. Basically that’s it. 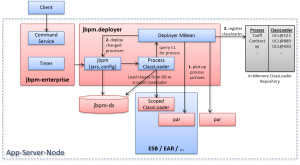 By the way, besides all that we use the existing jbpm-enterprise.ear (but without any jbpm libraries or configurations, so we definitely have them only once on our system). With using the enterprise version of jBPM JMS is used for asynchronous Jobs and EJB-Timers for jBPM timers, so we switched of the JbpmJobExecutor completly. shouldn’t have any more classloading issues (concerned with jBPM). I have implemented something like this in jBPM but also I can upload new EARs with custom commands. This is because I need to deploy new applications that use new commands on demand and keep this commands decoupled from jbpm-jpdl.jar and the rest of my applications. This information has been very helpful and also validates my current versioning implementation. You have obviously taken it to the next level with your more complex configuration and it is good to know that is it possible. Thanks for sharing this information.